Collins Booksellers - Have You Heard the One About . . . by Justin Sedgwick, 9781510729261. Buy this book online. Having trouble finding things to talk about with people? Feeling awkward amidst a tense moment or gap in conversation? Do you need some comic relief? Good news: Your arduous search for the holy giggle ends with this book. Have You Heard the One About . 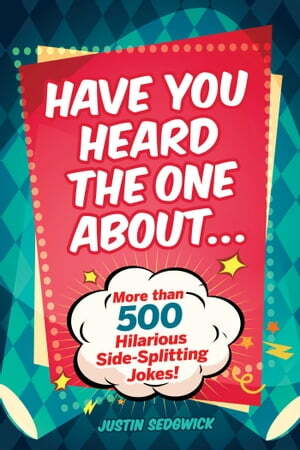 . . includes over 480 pages of gut-busting jokes and amusing anecdotes that readers can memorize and add to their conversational repertoire. These jokes, with their charming wit and large variety of subject matter, are sure to get a chuckle from even the most miserable human-beings! So grab a copy with Have You Heard the One About . . . , it’s the perfect humor reference to study before any party or occasion, or when you feel the need for a good hoot or a ha-ha. Start filling the room with laughter today.